What is the world coming to? I just gave an “A” to a movie released in February. This isn’t the time for good movies...this is the time for really bad romantic comedies, silly kids movies, and terrible animated fare, not the time for phenomenal, oscar-caliber movies. I doubt that “In Bruges” will be remembered when all the top ten lists are compiled and awards handed out, but I’m going to my best to remember, because this film seriously deserves the praise. Following a botched hit in London, Irish contract killers Ray (Colin Farrell) and Ken (Brendan Gleeson, aka Mad-Eye Moody in Harry Potter 4) are sent to the quaint Belgian town of Bruges (pronounced “Broozh”) and told to wait for further instructions from their employer, Harry (Ralph Fiennes, aka Voldemort in Harry Potter 4). While Ken takes in the sights and historic medieval villages, Ray is morose and withdrawn, disgruntled with Bruges' lack of nightlife and wracked with guilt over his accidental murder of a child. One night, while observing a film production with the dwarf actor Jimmy, Ray meets and falls for Chloë (Clémence Poésy, aka Fleur Delacour in Harry Potter 4....there seems to be a theme here), a local production assistant. Things don’t all go swimmingly, of course, but that’s for you to discover. The plot is quite smart, and moves at an excellent pace. So, on the most basic level, you could call this film a comedy. Indeed, I haven’t laughed so hard in a long time. The dialogue is pitch-perfect, smart and witty at every term. These characters have real life and chemistry together, which is a combination of the writing and the phenomenal performances. Colin Farrell and Brendan Gleeson are very believable as both buddies and hit men, and their banter is a hoot. The comedic part of this film is an absolute home run. And that’s where the film succeeds the most. There’s heavy comedy and heavy drama, and when most films attempts this, they don’t mix the two together right, and it feels awkward. But somehow, “In Bruges” really melds the two perfectly. There’s never a feeling like the film is trying to be two different movies. The balance is right on the dot, and propels this film to greatness. As I said above, the acting also really pushes this film over the edge. Colin Farrell has surprised me in the last month. I never liked him much. He’s done lots of really bad movies (Phone Booth, Daredevil) and I never saw him as a great actor. But in the last month, he’s totally redeemed himself. Woody Allen’s new movie, “Cassandra’s Dream” was another phenomenal film (it opened in Denver last month) and Colin Farrell was simply terrific in that movie (it happens to be the other best film of the year so far). Oddly enough, he also played a hitman with regrets in that film. Maybe that’s just the kind of role he excels at. I’ve always liked Brendan Gleeson. He was the actor that made the otherwise terrible “Harry Potter and the Goblet of Fire” worth watching, and has been good in plenty of other supporting roles. I was glad to finally see him as a lead, and he does a fabulous job here. As the duo’s boss, Harry, Ralph Fiennes is delightfully evil. I’ve only ever seen Clémence Poésy in the fourth Harry Potter movie as Fleur Delacour, and since the screenwriter of that movie opted to give the character no lines, I can’t tell you whether or not she’s a really good actress. But she did the job very well in this film, and rounds off the excellent cast nicely. I also have to give a shout out to the excellent cinematography. The beautiful city of Bruges is well represented by the camera work, but this is a fun film to look at. 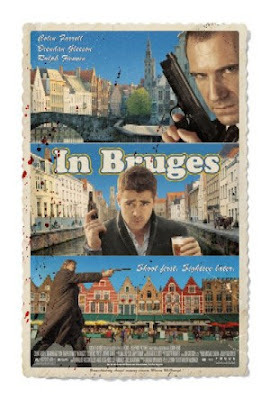 Rarely does a film make me want to travel, but if I had a million dollars, a trip to Bruges would be on my to-do list. I really can’t recommend this film highly enough. Yes, it is a bit strange, and is definitely not mainstream. But given the quality of mainstream cinema right now, that can only be a good thing. If this sounds like your kind of movie, then trust your instincts and go see it. “In Bruges” is the best film of the year so far, and I doubt that praise will be usurped by another film anytime soon.